The month of March is ringing in spring at the LVM Nature Park in Tērvete! Pine forest is already filled with chirpy and loud bird songs that bring joy to our hearts and minds. The LVM Nature Park in Tērvete in March gives an opportunity to nature friends to build a birdhouse for little birds with their own hands. On the weekends go to the Dwarfs’ Cottage and build a birdhouse for winged forest inhabitants! Birdhouse workshop is open at the Dwarfs’ Cottage, where the knowledgeable and skilful Dwarf will reveal the secrets of building and setting up birdhouses. Parts for 100 small bird birdhouses are waiting for their craftsmen. There is a time for work, and a time for active recreation. Small and big nature friends after the visit in the workshop are invited to go on a joyful walk, climb the big Wooden View Tower and discover the bright, colourful and exciting dwarf town “Čiekure”! 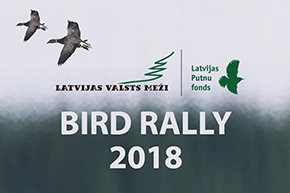 And in the spirit of the Bird Days the environmental education specialists of Nature Park in Tērvete are organising special educational lessons in collaboration with D. Boiko, the ornithologist of Latvian Museum of Natural History. Schoolchildren will learn about different life habits of birds in spring, more stories will be told about the noble migrating birds – swans. Those nature friends, who are very interested in birdwatching, here, at the edge of pine forest, next to extensive meadows, the LVM Tērvete Reservoir is located – a treasure guarded by a forest. In spring the water of reservoir is rippling and flickering, ringing and booming from the great number of its inhabitants. A particular activity can be observed in late afternoons, when it is slowly getting dark. The picturesque surroundings of Tērvete Reservoir, silky surface of water and the tangible joy of arriving spring are just calling you for a leisurely stroll. On March 23, the LVM Nature Park in Tērvete invites to an active and venturesome event “Hop, Hop to Forest!”. Check out, learn and run through the mighty pine forest that is full of stories and events! However, on March 30 an educationally rich and active two to three hour long hike will take place in the large territory of Nature Park in Tērvete, that all together with zoologist, expert of the Nature Conservation Agency, enthusiastic nature explorer and observer – Vilnis Skuja. More information @LVMdabasparksTervete. The LVM Nature Park in Tērvete invites to go into nature, to enjoy the arriving signs of spring! Go on a hike with enthusiastic natural scientists in LVM Nature Park in Tērvete!